Museum of Northern Arizona (MNA) staff conduct frequent consultations with Native artists, scholars, and cultural preservation officers in efforts to accurately represent indigenous cultures. During the course of several recent meetings, Navajo consultants told museum staff that they wished to see the complex history of relations between their ancestors and Euro-Americans more fully represented than has heretofore been the case in most museum displays. One historical period that consultants expressed a desire to see represented in greater depth was the early colonial period. Fortunately, the MNA collection includes several slave blankets, and Navajo consultants identified one such piece (MNA Collection Number 2723/E5514), which bears a striking resemblance to a Saltillo serape, as of special interest. Saltillo serapes, produced in northeastern Mexico, were highly popular in the mid-1800s. Exquisitely woven, they bore a central, serrate-edged diamond motif, banded design field, contrasting borders, and a prominent center seam that resulted from the sewing together of two identical bands of woven fabric. Slave blankets were produced with materials and dyes available only in Spanish and Mexican households of the period. In high demand in the Southwest due to their high quality and elegant design, they were also traded in Mexico, thereby entering an international art market, ending up in Hispanic households and sometimes finding their way to Europe. Hybridity is not unique to Navajo slave blankets. Navajo weavers have always been open to incorporation of influences from other cultures. Since at least the 1800s, Navajo weavings have been produced and appreciated at the intersection of complex and diverse cultures and multiple markets. Among the most prized textiles exchanged within 19-century North American intercultural trade networks, they were actively sought out by Southwest Hispanic and Mexican communities for personal use and trade. 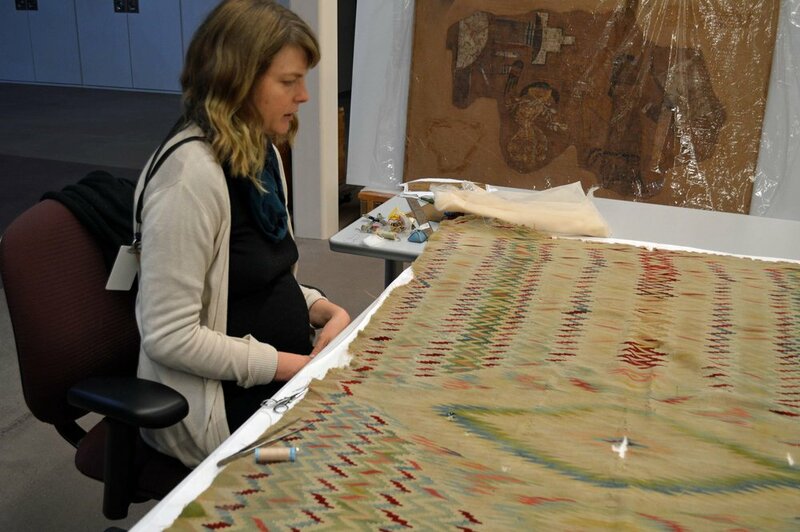 Wearing blankets produced by highly skilled Navajo weavers also found their way to the Northern and Central Plains where they were especially prized possessions of high-status members of such tribes as the Blackfeet and Lakota. a significant and intriguing piece in the collection. 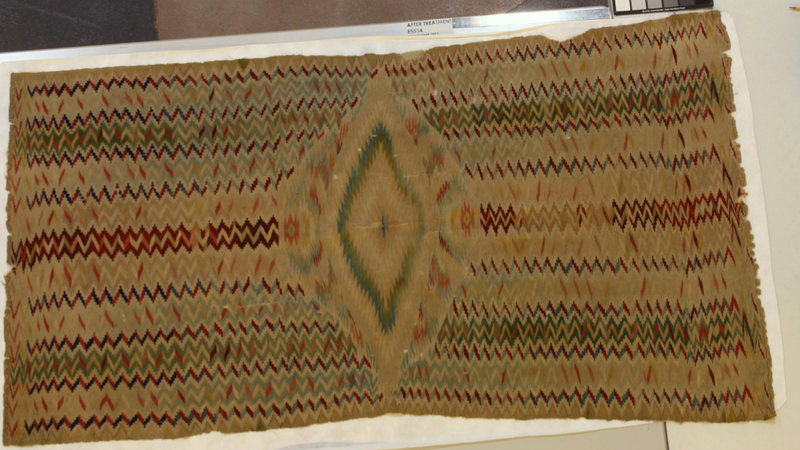 Previously cataloged as a Hispanic New Mexican weaving, it appears to be a Navajo-woven version of a Saltillo serape with a poncho slit, dating to the period ca. 1860- 1865. The yarns and weave of this serape are incredibly fine, and its Saltillo-influenced design, silky texture, and soft color palette strongly resemble the Chief White Antelope blanket from the same period. The identification of 2723/E5514 as Navajo-woven rather than Mexican is based on the presence of selvage cords along both sides and one end, and on the use of terraced (rather than serrated) chevron motifs in the background bands. Another interesting feature of this textile is the presence of commercial linen warps. These are extremely rare in Southwestern weavings, but common in Mexican Saltillo serapes. The wefts include handspun churro wool yarns and very fine 3 and 4-ply commercial yarns. However, Webster determined that the piece was in fragile condition and needed stabilization. The services of textiles conservator Rachel Freer-Waters were enlisted and she determined that the piece could be sufficiently stabilized. Freer-Waters produced a proposal for the piece’s conservation and stabilization, and MNA Collections Director Elaine Hughes submitted the proposal to ATADA for funding. Funding was awarded, and Freer-Waters proceeded with treatment. She carefully vacuumed the piece and stabilized tears and losses by underlaying the weaving with sheer polyester fabric, using available yarns in matching colors to stitch the fabric in place. The center of the weaving showed significant damage and, in order to reduce the visibility of such loss, she underlay it with opaque fabric. Before and after photographs show significant improvement in the weaving’s appearance (see illustrations). Cleaned and stabilized, this historically significant weaving serves as testament to the ways in which Navajo weavers have adapted to demands of multiple and shifting markets and trying social conditions. James F. Brooks, Captives and Cousins: Slavery, Kinship, and Community in the Southwest Borderlands (Chapel Hill: University of North Carolina Press, 2002), p. 239.